Last night, I had plans to meet up with friends for dinner downtown. I faced a bit of a struggle to find something to wear. I didn’t want to pull a look that screamed “boring office-wear,” yet I also didn’t want to risk being too casual. I ended up pulling together a simple jeans and dress shirt look, but rolled my sleeves up so that I wasn’t overly “stuffy.” I threw on a pair of brown narrow-toed lace-ups, and was good to go. While I was out, though, I noticed an array of looks which ranged everywhere from too “officey,” to overly-trendy, to “I can’t even talk about that outfit right now…” Gotta love DC fashion sometimes. It can be completely random. When choosing a top that can work fine for both the office or a night around town, go for a “trim” or “slim” fitted shirt. Depending on the label, “trim” can be more fitted than “slim” or vice-versa; give the shirt a try to know for sure. A more fitted top, looks more refined than an overly baggy shirt. The slim look works well with trousers, too. Instead of wearing pants that hang off your waist with too much room in the seat, go for a pair that rests just at the waist, or slightly below… and fits closer to the leg. Again, too tight can be a bit restricting, so it’s best to pick a pair of slim fitted pants that are just right. You can tie together the complete look with the perfect shoe. A smart shoe can make all the difference. Some guys make the mistake of throwing on shoes that are too dressy (i.e., shoes that are more appropriate to wear with a formal suit) or too chunky (i.e., shoes that are shaped like boxes). A shoe that nicely doubles-up as a casual and business-casual smart pair is always a good choice. A white shirt does not have to be “boring.” In fact, the Slim-fit Plain Structured Shirt (top left) from Massimo Dutti is not too formal, but is sleek enough for both the office or at a nice restaurant in the city. Pair the shirt with a colored pant like the Selected Homme ‘Logan’ (bottom right) from Topman, priced just at about $110. 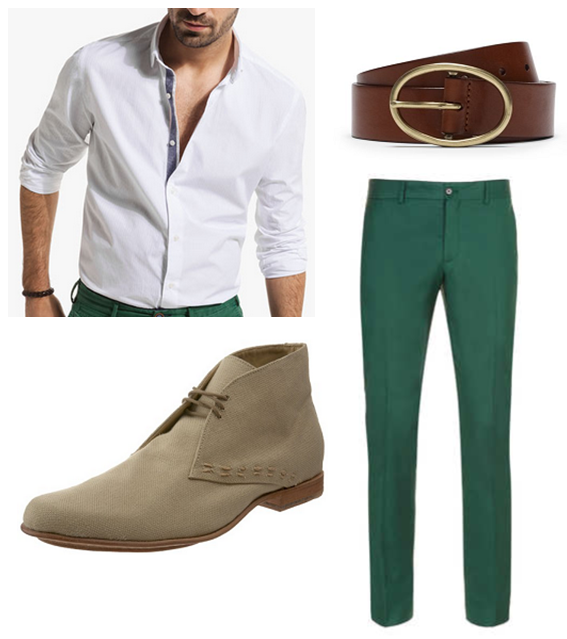 Finish off the overall look with the Romel Beach Chukka boot by J. Artola (bottom left), and an understated belt like Club Monaco’s Parker Oval-Buckle Belt (top right). Play around with colors, or even prints. Men’s fashion lines currently sport an array of pants, shirts, and even shorts with cool floral and geometrical prints. Make sure you’re ready for those Summer nights out, and always look your best. ← Hot Sauce Art… Only in L.A.